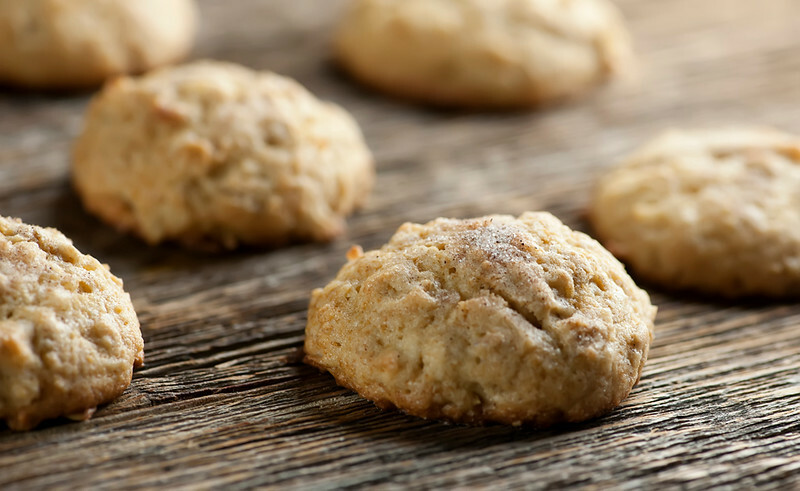 This recipe for coconut oatmeal cookies with just a hint of cinnamon sugar makes a delicious old fashioned comforting treat. Warm and wonderful and the perfect thing for that cookie jar I know you have! These coconut oatmeal cookies are not the hearty, chewy oatmeal cookie you are probably used to. Nope, these oatmeal cookies are soft and pillowy and dusted with just a little bit of cinnamon sugar for just a hint of extra sweetness. They are a shy, sweet cookie that looks and tastes so gentle that you want to give it a hug and tell it that it’s just as wonderful as all the other show-off cookies, because it IS. They are perfect with a warm cup of Irish breakfast tea, and exactly what you want to make for a friend who is in need of a plate of cookies. And we all have friends who are in need of plates of cookies from time to time. Let’s make some! In my case, I made a plate of them for a whole bunch of friends. As in, the raucously wonderful group of folks I spend my days in the office with. Every now and then I like to get their Monday mornings off to a good start by bringing them in a plate of something sweet. That’s right…I have another life outside of my kitchen, and here I am in my other natural habitat, aka my office in feisty lower Manhattan. 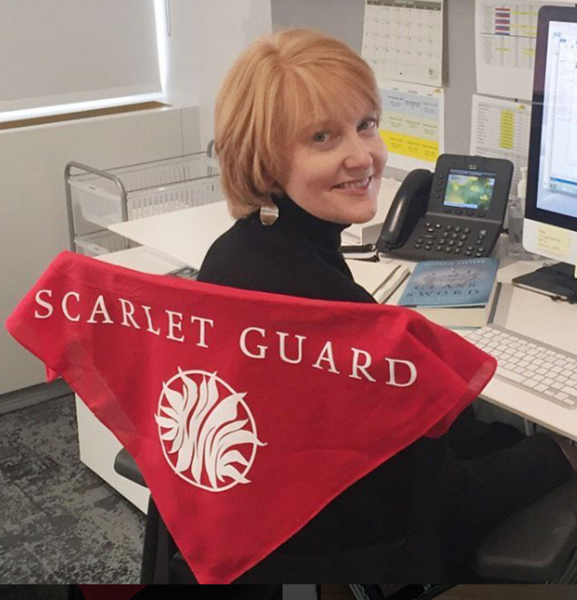 And if you are wondering what the Scarlet Guard is all about, click the picture. It has nothing to do with the red hair. This super easy recipe for coconut oatmeal cookies with just a hint of cinnamon sugar makes a delicious old fashioned comforting treat.Click to TweetAnyway, I adore my brilliant and creative and hardworking co-workers, and the least I can do is put my money where my mouth is by hooking them up with some coconut oatmeal cookies and other goodies from time to time. These babies get their pillowy softness from the fact that there is a pretty good ratio of flour to oatmeal, and the coconut is baked right into the dough. There is a little cinnamon mixed into the dough as well, but I like to amp it up a little by sprinkling on some cinnamon sugar right before I pop them into the oven. I do keep back a few for the Southern husband, because I love him too. With cookies, it’s always good to spread that sweet-tasting love around. So the next time you get the urge to bake up a treat for someone, give these babies a try – and don’t forget to hold back a few for yourself! This super easy recipe for coconut oatmeal cookies with just a hint of cinnamon sugar makes a delicious old fashioned comforting treat. Preheat oven to 375 and line cookie sheets with parchment or silicone baking mats. Put butter and both sugars in a mixing bowl and beat until fluffy. Add eggs one at a time and beat on medium speed until blended in. Place flour, oats, coconut and baking powder in a separate bowl and mix with a whisk until combined. Add to mixing bowl with the butter mixture and mix until blended. Add milk and vanilla extract to the bowl and mix one more time. Place dough by rounded tablespoons on cookie sheet, about 2 inches apart. Sprinkle a little cinnamon sugar on each cookie and bake until golden, about 15 minutes. Cool for a few minutes on the cookie sheet and then remove to a cooking rack to cool further. My fabulous friends here at work are doing me a favor by giving me an outlet for my incessant baking! You have a great weekend too,my friend! Yum and Yeah! Little cookies mean it is OK to eat more than 2. Or 4. Or…12. :) My 13 year old daughter is currently reading Red Queen and is really enjoying it. (I can tell because she’s reading it instead of doing homework.) Need to get Glass Sword for her soon! That’s DEFINITELY what little cookies mean. And so excited to hear that your daughter is loving our wonderful Victoria’s books!! Kate, you are just too cool. I’m jealous of your work location! And you look amazing in the pic, too! I also bring in stuff Monday AM for my coworkers. It brightens their day that much more. And these cookies would brighten mine! Right back at you, Mir! I love having such a fabulous group to bake for – it’s the best! I had no idea you worked in NYC! I would move there in a heart beat if I could…I just love Manhattan. But convincing my husband is another story haha! These cookies look delicious, Kate! I love that they’re soft and have a sweet topping. Sounds perfect! my computer wouldn’t load the recipe, but i still have no doubt i’d love these–coconut + cookies is a foolproof combo! Ooh, wow. I’m loving all the coconut in these. I definitely could imagine myself having a couple of these with some breakfast tea! ???? I think it’s the perfect breakfast – cookies and tea! Love the hint of cinnamon sugar you put on top, it adds a little something special to the cookies, they look delicious by the way! Yum! These cookies look delicious! Your co-workers are so lucky! Anything with coconut is a winner in my book and oatmeal cookies are my favorite so I know these would be gone in no time at our house! Love how soft and pillowy they are! Well, my co-workers are pretty sweet themselves, so it all works out! Hi Kate, I always enjoy your recipes and these cookies are delish. It drives me batty when people suggest changes to make something better however, I am wondering if you accidentally omitted salt. I did add it to my batter after a taste test. In any case, these cookies will be made again!